Description Together with 59.1 and 59.3, this piece is part of a series of large gold medallions that was commissioned to honor Emperor Caracalla, representing him as the descendant of Alexander the Great. These medallions, found at Aboukir in Upper Egypt, demonstrate the artistry and technical prowess achieved by an imperial mint, perhaps that of Ephesus or Perinthus (both cities in western Asia Minor). 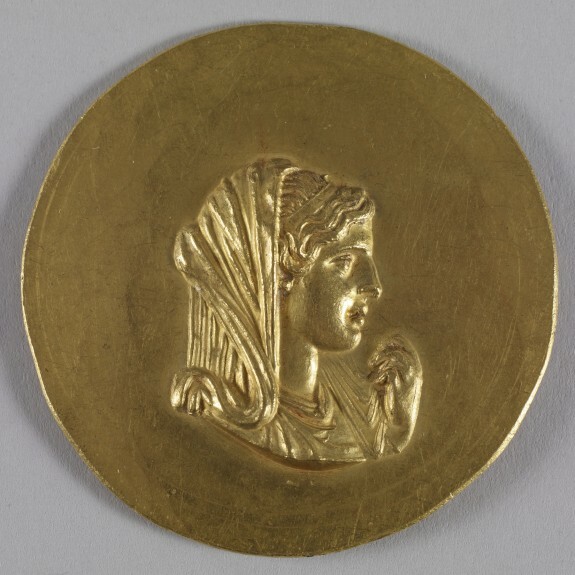 Olympias, mother of Alexander the Great, is depicted here in profile. The back shows a "nereid" (sea nymph), perhaps Thetis, the mother of Achilles, riding on a hippocamp, a mythical sea-creature. 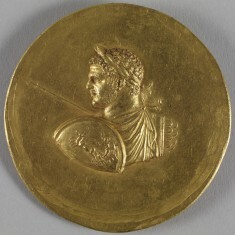 Thus, the medallion forms part of a double comparison: Caracalla is compared to Alexander, the conqueror of the East; Alexander is compared to Achilles, a hero of the Trojan War. The Search for Alexander. National Gallery of Art, Washington; The Art Institute of Chicago, Chicago; Museum of Fine Arts, Boston, Boston; Fine Arts Museums of San Francisco, San Francisco; New Orleans Museum of Art, New Orleans; Royal Ontario Museum, Toronto. 1980-1983. 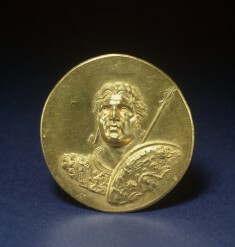 Alexander the Great: Treasures from an Epic Era of Hellenism. Alexander S. Onassis Public Benefit Foundation (USA), New York. 2004-2005. Provenance [Found at Aboukir, Egypt, 1902]; Panayotis Kyticas, Cairo, [date of acquisition unknown], by purchase; Dikran Kelekian, Constantinople and Paris [date of acquisition unknown], by purchase; Henry Walters, Baltimore [date of acquisition unknown], by purchase; Walters Art Museum, 1931, by bequest.